On Feb. 13th I came across a photo on-line that looked very interesting. A large falls, not far away which looked very runnable in the photos. I sent out an email to Luke Spencer titled “Why have we not looked at this?” The subject of the message was Middle Bridal Veil Falls. Only a half mile off the historic highway, it is one of the lesser known waterfall tourist attractions. That fact alone makes it more intriguing and seemingly more untouched. Middle Bridal Veil Falls is located near the end of a narrow canyon about a half mile up from the Historic Highway on Bridal Veil Creek. It has a trail up to the base of the falls and access up Palmer Rd. to the top of the canyon. If you want to be in the pool below it then you have to hike up the creek from the bottom and not the rd. Much like the Lower Bridal Veil Falls this one has remnants of the old logging operation that went on through this creek bed in the late 1800’s up to 1937 when the mill burned. As curious waterfall hunters do, Brett Barton and I set out on foot heading up the creek to find the falls. It looked great, top to bottom, we just couldn’t see the face of the falls, head-on, or the pool up close and we were out of time for the day. So I sent out a few messages and Friday Feb. 19th we met just after a few days of rain. The creek was the same level as the previous scout and soon we were all facing the falls and all of it’s hidden beauty. This angle showed some of the hidden concerns of running the falls. Brett, Tony, Luke, Andrew, Keel and I inspected the face of the falls as close as we could. On the previous trip we saw a large cable draped from the lip of the falls to the opposite ridge. On this trip we saw a cable that had been severed and is now hanging down the center of the falls. Concerns about debris in the pool complicated matters and most of us decide we wanted to come back at lower flows to inspect the pool closer. Tony, however liked it as is and we decided to gear up and go up to the lip of the falls. Second scout – concern with the cable in the falls. The put-in had its own challenges as well. It was a steep hike down using ropes and as we scanned for a place to secure a boat for a put-in we were forced to use a tiny eddy not far from the lip of the drop. Tony was still interested so we pushed the boat up to the river wide log and carefully placed the boat on the other side so he could drop in. It is an intimidating put-in this close to the lip of the falls, sitting in a moving eddy that drifts into the current and straight off the jagged lip of the falls. Tony got ready, pulled out of the eddy moving right, rolled off the lip and went into his tuck. Seconds later he was looking back up at the falls with a big smile. Despite the shallow looking features at the lip, he said he didn’t touch anything but water on his line. In the parking lot before we all left Tony dubbed the falls ‘Cable Choke’. On March 7, Brett, Keel, and I returned with Nate and Heather Herbeck, Trevor Sheehan, and Johnny Ott to attempt the falls again. After meeting the cloudy skies cleared and we had a little sunshine to start the day. Half of us went to the top while the others started the slow hike upstream. The hike down is steep with loose rocks here and there. I had to set my boat down and work my way to the closest tree to the water, still about 30ft. off the water. Then I noticed, out of the corner of my eye, an unexpected loose rock tumbling and gaining speed down the hill up to my right. It crashed into the side of my boat and sent my boat and paddle launching off the cliff and into the creek below me. Everything was collected quickly and we focused on the task at hand. Once we were at the lip of the falls we wasted no time. The falls and the line looked better than ever and I got in my boat with Trevor’s help, took a minute to clear my head and paddled out of the back of the eddy. The line felt great, read and run class 3 lip straight into free fall… to re-connect to landing. At the top Brett held Trevor’s boat while he got ready. Trevor came off with a nice line and landing resurfacing downstream of the landing zone. We celebrated at the bottom and headed back to the cars. 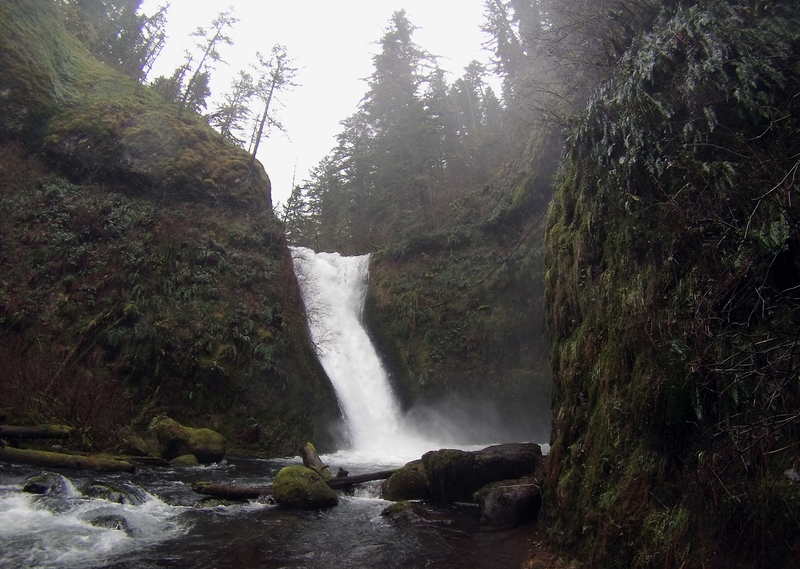 Another successful day in the land of waterfalls here in the beautiful Columbia Gorge. * Editor’s note; The main Tourist attraction “Lower Bridal Veil Falls” just off the historic Highway has two tiers (Two parts) to it so I have always called the upper tier “Upper Bridal Veil” and the lower tier “Lower Bridal Veil”. In actuality, they are both considered “Lower Bridal Veil Falls”. Cable Choke is technically “Middle Bridal Veil Falls” and “Upper Bridal Veil Falls is another impressive waterfall further upstream than the Middle Falls. There has been a proposal for a trail to be built (Details Here) that will allow easier access upstream. For now if you want to reach Middle Bridal Veil Falls hike upstream at water level until you reach the base of the falls, If you want to go higher up the creek it’s easier to take Palmer Rd up the creek to scout. 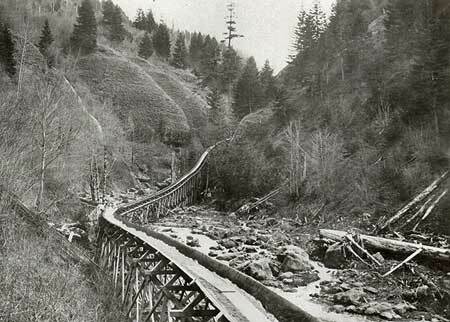 Log Flume downstream of Middle Bridal Veil Falls.